This past spring, I started using an eNewsletter service called MailChimp to send my Weekly Parent Email Update. I have been sending this update through Gmail for the last two years, but after reading Brian Dixon’s book Social Media for School Leaders, I became convinced to try an online eNewsletter service. I chose MailChimp after speaking with a parent who had already been using the service as a part of her job. As Dixon points out, there are several advantages of using an online eNewsletter service. Collecting email addresses for your contact list is a simple process. Using an eNewsletter service like MailChimp makes collecting email addresses for your contact list simple. All you need do is provide access to a URL link or a QR code, and parents as well as others can sign up. When they click on the link, they access a form that asks them to enter their email address, first name, last name, and their preferred format for the eNewsletter. Then, they click on “Subscribe to List.” Once they subscribe, you receive an email notification of their subscription. If they use the QR code with their mobile device, the same form will appear on that device. They simply enter the information and submit. ENewsletter services like MailChimp make it quite simple to collect your newsletter email contact list. You can standardize the format of your eNewsletter with customizable templates. The issue I had sending my newsletter through regular email was having a standard format each week. Using eNewsletter services like MailChimp means you can create a template that you use each week. You simply enter in the new information every week. The templates allow you customize color schemes, bylines, insert clip art, add photos, and even your mastheads. Having the ability to customize the look of your eNewsletter means you make it suit the needs of your school or district. You can schedule when your eNewsletter will be distributed. Another handy feature of eNewsletter services like MailChimp is that you can schedule when you eNewsletter will be sent. This means you can schedule it to hit your parent's and stakeholder's inboxes at the most opportune time possible. You can track how your parents interact with your eNewsletter. MailChimp gives its users the ability to check statistics to see how many of your parents actually open the eNewsletter, top links clicked, subscribers who open the eNewsletter the most, and if there's social media activity. What this does, is allow you to view all the activity involving your eNewsletter and make adjustments to get more of your stakeholders reading and clicking your content. You can set up an eNewsletter archive. Keep all your old eNewsletters in a library for future access. If you would like to see how the subscription link works, check out our school link at Discovery High School’s Web Page. I see two drawbacks so far with eNewsletter services in general and MailChimp specifically. First of all, learning the software is fairly steep, though anyone who has experience updating a blog or web page can probably figure it out. There are quite a few features, so taking time to figure them out is a must. Using onsite video tutorials will help. Secondly, trying to keep your eNewsletter from ending up in your stakeholders' spam folder is also a challenge. I still struggle with that one, but apparently the key is make your eNewletters least resemble spam in the first place. I haven't been entirely successful with this one, but I am working on it. As Dixon points out, getting a high-quality eNewsletter out to your stakeholders and community, will go a long way in promoting your school. While the learning curve using an eNewsletter service might be a bit steep, MailChimp and other eNewsletter services provide powerful tools for using technology to reach your larger school community. How many times have you sent an email and immediately regretted doing so after pushing the send button? How many times have you sent an email, and the receiver of that email got it all wrong about what you meant to say? The media is replete with stories of politicians, public officials and celebrities who make the news because they sent an insensitive email or distasteful joke. When these things happen, the problem isn't with the email. It does what it's supposed to do. The problem is a lack of mindfulness when reading, composing and sending email. 1. “Begin by taking one conscious breath.” This is key when you receive that particularly explosive email in your inbox, and your first inclination is blast back a response. The key to this step, as Tan makes clear, is to calm your mind. You can practice breathing, walk away from your desk, or go to the restroom, but the important thing to do is create a pause between your emotional reaction and your response. To keep from sending an email that further complicates the situation with miscommunicated thoughts and ideas, stop and take a few breaths before responding. That should give you the room to keep from reacting in a harmful manner. 2. “Mindfully reflect that on the receiving end, where there are one or more human beings. Human beings just like me.” Tan even suggests visualizing the person on the receiving end, if it is a particularly difficult situation. The problem with email and other technological messaging is that many people too easily forget that a living, breathing person will receive that message. You can’t do that with a phone call, because there’s a real-time voice connection to a real person, but if you aren't connecting real time with a person, it’s too easy to forget you are interacting someone. This step makes sure that you remember, with compassion, that a person will be reading your message. That should help you make your message or response more compassionate and understanding. 3. “Write your email.” After completing the first two steps, type out your email message. 4. “Before sending your email, mindfully reflect on the insight that if the emotional context of your message is unclear, the receiver’s brain will just make something up that is likely more negative than you intended.” Here, you can put yourself into the receiver’s shoes. As Tan suggests, pretend you already have a negative emotional bias and read you email message. After doing this, revise your email. 5. If you don’t have to send the email at that moment, save a draft, and do it later. (NOTE: This step I inserted; Tan did not include it in his Mindful emailing.) I personally have always saved a draft of an email that has some emotional charge to it for sending later. If you don’t have to respond immediately, then why respond? Respond when cooler heads prevail. 6. “Take one conscious breath before sending.” As Tan points out, if the situation is really delicate, take three conscious breaths. I would add, take three days if you can and need to. Feel completely free to change your mind about sending it. Being overly cautious and deciding to speak to the individual in person or by phone instead is never a bad idea. When in doubt, avoid sending a message that might miscommunicate your message or who you are. In an age of instant communication, remembering that you can’t take an email back once you've sent it is important. The Practice of Mindful Emailing will go a long way in preventing an already tense situation from getting nastier. It will also keep you from sending that email you may later regret. “States have implemented teacher evaluations in their race to avoid the impossible demands of NCLB.” W. James Popham, Evaluating America’s Teachers Mission Possible? Getting teacher evaluation right should be a priority, and in my opinion, a higher priority than any other educational initiative on the table right now. How we evaluate teachers will impact more of what happens in our classrooms than any other reform measure we implement. For example, if we make test scores a large part of this evaluation, then we can expect much of what happens instructionally is going to directed toward improving test scores. If we make technology a priority, we can expect to see more teachers engaging in its use in the classroom. And, if getting students working collaboratively is emphasized, then expect to see teaming as a big part of classroom practice. What get's evaluated is what gets done, period! As Popham points out, "A teacher-appraisal system that inclines teachers to make good instructional decisions is likely to do just that. Conversely, a state teacher-appraisal that points teachers in unsound instructional directions, will, unfortunately, also just do that." What we evaluate is going to be what we get instructionally. With the importance of what to include in our teacher evaluations in mind, getting teacher evaluation right should not be a hurried process to satisfy federal education policy, though that is what has happened in many states. In order to get waivers from the impossible and ludicrous demands of federal No Child Left Behind legislation, states have been hurriedly putting together teacher evaluations that include using test scores in some manner. This express route to using test scores to determine teacher quality should be frightening to any educator and our parents because of the likelihood that how students do on tests will become the center of what we do in our classrooms. In a word, our schools, every single one of them, become massive "test-prep centers." Let's just hope those evaluations encourage sound instructional decisions and not unsound decisions. Otherwise, we could end up with an education system much more worse off than what we have. What then are some major mistakes states could make in this rush to implement federally mandated teacher evaluations? In his book Evaluating America's Teachers Mission Possible? W. James Popham describes what he calls "Four Teacher Evaluation Implementation Mistakes" that is, perhaps, a good start for critiquing these state teacher evaluation schemes. According to Popham, implementation mistake one is simply using "poorly chosen evidence" to determine teacher effectiveness. Evidence is poorly chosen when it does not accurately or in a valid manner tell us anything about a teacher's quality. For example, an observation by a poorly or untrained classroom observer may not provide us with appropriate evidence to determine a teacher's quality. Also, using state achievement tests may also be poorly chosen evidence as well. As Popham clearly points out, "There is almost zero evidence that these state accountability tests yield data permitting valid inferences about a teacher's instructional quality." So even standardized test scores could be inappropriate evidence if one can't make a valid inference about teacher quality from those tests. With this mistake in mind, it is vital that administrators and teachers carefully scrutinize what states choose as evidence in their teacher evaluations. Improperly weighting evidence involves assigning improper weights to the various forms of evidence used in teacher evaluations. The different sources of evidence most often used include: 1) student test performances, 2) administrator ratings of teachers' skills, 3) classroom observations, and 4) parent or student ratings of teachers. As Popham points out, "a weighting mistake occurs when a given source of evidence is given either far greater, or far lesser, evaluative importance than it should be given." In other words, this error occurs when states place too much or not enough emphasis on one source of evidence. For example, some states weigh test scores as 50 percent in their evaluation schemes. Such heavy weighing of test scores is improper, if those tests do not really allow one to make any valid inferences about teacher quality. Properly weighting the evidence means doing so in a reasonable and fair manner. It is important for teachers and administrators to also scrutinize the weighting scheme states apply to teacher evaluations as well. As Popham points out, "To evaluate teachers as though they were operating in identical instructional settings is naive." Using a "cookie-cutter" evaluation system that fails to take into account the unique qualities of that teacher's instructional setting forces standardization when classrooms are far from being standardized. Doing so will not make them standardized either. When a teacher evaluation system weights all evidence without taking into account a teacher's instructional setting, you are going to force that teacher to do the "hoop-jumping" dance, just to satisfy the evaluation. Also, classrooms are as diverse as the teachers teaching them. Even in the unreal world of 20th century, factory designed instructional settings were not standardized, though some nostalgically think so. To evaluate teachers as if they were all teaching under the same conditions shows pure ignorance of what goes on in classrooms. They are highly, complex and diverse environments, and to think one can evaluate them the same fails to take into account this diversity. Teachers and administrators would do well to scrutinize the evaluative weights states place on various forms of evidence and demand that those weighting systems accommodate the diversity of instructional settings that exist too. As Popham points out, "Formatively, we want to improve teachers' prowess so they can do their most effective job in helping students learn. Summatively, we want to identify the exceptional teachers who should be rewarded as well as those teachers who, if they cannot be helped, should be relieved of their teaching responsibilities." Mistake four involves combining these two functions of teacher evaluation. As Popham points out, these two functions of teacher evaluation can conflict with each other, making neither effective. In addition, isn't it really unrealistic to expect a teacher to open up and be candid and reflective about their performance with the person who holds their future employment in his or her hands? Perhaps it us time for teachers and administrators to advocate for separating the formative and summative functions of teacher evaluation so that both work more effectively and can do their jobs of improving teaching. Getting teacher evaluation right should be a high priority, because how teachers are evaluated is going to directly impact how instruction is carried out in the classroom. Unfortunately, states, in my opinion, including my own state North Carolina, have rushed to try to satisfy federal mandates for that evaluation system, and I fear the negative impact on education and the teaching profession in North Carolina, and around the country, is going to be felt for years. Looking back through my reading notes, if I had to select 7 books that I suggest as “Must-Reads for the Summer of 2013” here’s those seven. Each of these books forced me to examine and challenge fundamental assumptions I had about teaching, technology, leadership and education. Thinking about turning your classroom into a “student-centered classroom” veteran educator Mark Barnes offers powerful advice and strategies on how to do that with this book. Even if you aren’t planning to go full-scale student-centered, this book offers quite a bit of information that can help you turn your classroom into an engaging environment for your students. "Most successful teachers learn from a combination of resources, including local communities, virtual communities, and research," writes Kristen Swanson in her new book Professional Learning in the Digital Age: The Educator's Guide to User-Generated Learning. In other words, educators learn from the communities to which their are connected, and having the tools to make those connections are truly vital in the digital age. That's where Swanson's book comes in. Packed in only 109 pages, she gives readers the process and tools to become a connected educator in the 21st century, and engage in "user-generated learning." Professional Learning in the Digital Age is a must read for educators who want to fine-tune the process of building and maintaining professional learning networks. And, for those have yet to venture out and begin the process of becoming a connected educator, this book gives them clear straightforward advice on how to do it, and a Tool Repository at the back of the book with which to get started. Professional Learning in the Digital Age: The Educator's Guide to User-Generated Learning, Eye on Education, is powerful-succinct guide for all educators to learn 21st century style. This book will challenge your thinking about what schools in the 21st century are about, and it suggests what our schools should be doing which is as the title suggests, educating creative and entrepreneurial students. Zhao points out what’s wrong with the standards and accountability movement and why that’s not going to produce successful students in the 21st century. He offers a model of education that educates student to be creative entrepreneurs, which he argues, are badly needed to resolve all the thorny issues we now face. With his knowledge and scholarship about international education, he offers a vision of schools that challenges much of the current education reform that’s happening. What if you only had time and money to use and purchase six tools to teach your entire curriculum? What would those six tools be? Authors Harvey Silver, R. Thomas Dewing, and Matthew Perini seem to do just that in their book The Core Six: Essential Strategies for Achieving Excellence with Common Core. Many of us are right in the midst to implementing the Common Core Standards, whether we philosophically agree or disagree with the need for their existence. School leaders and teachers are scrambling to find and create tools for implementation, and the massively growing number of new books and materials about the Common Core aren't making this task any easier. However, there are few that focus on the "essentials" to the degree that The Core Six does. This concise volume (it's only 78 pages) lays what it calls "Six Core Practices Students Need to Cultivate to Become Independent Learners." Mindful Leadership: The 9 Ways to Self-Awareness, Transforming Yourself, and Inspiring Others is the most practical application of Buddhist Mindfulness practice principles and Buddhist thinking to leadership that I have yet read. In a "no-nonsense" manner. author Maria Gonzalez takes readers through nine ways those who find themselves in leadership positions can engage in practices that foster authenticity, integrity, and centeredness as they try to lead and influence others. With meditation practice as the core of mindfulness training, leaders can learn how to simply be more "present" as they engage in their daily jobs. Gonzalez truly provides clear practices that any leader, Buddhist or not, can implement and become powerful leaders of their organizations. This is one of the most powerful leadership books I have read this year, and whether you are Buddhist or not, you will find gems of wisdom and strategies that make you a better leader. Popham’s book Evaluating America’s Teachers Mission Possible couldn’t be more timely with all states working to implement various kinds of teacher evaluation systems. This book offers readers advice on what mistakes need to be avoided in that implementation, and suggestions on what kinds of evidence these teacher evaluations should use. As usual, Popham makes this book even more interesting with his occasional irreverence and humor, so common to many of his books on assessment. For teachers wanting to educate themselves regarding what an effective teacher evaluation process should look like, this is an excellent read. For administrators who want to understand teacher evaluation from the perspective of an assessment expert in order to make sure that conduct teacher evaluations fairly and effectively, this book is also an excellent choice. In this book, Why Social Media Matters: School Communication in the Digital Age authors Kitty Porterfield and Meg Carnes write: "Skill in communication is a key ingredient for school leaders' success in today's complex education environment, and this communication now includes social media." As these author's suggest, school leaders "can either learn to use these powerful tools or stand hopelessly by and the information---good and bad---swirls around them." School administrators are still spending too much time trying to decide whether social media is an enemy or an ally. What they don't realize, that choice isn't really up to them. Social media is here to stay. It's not a fad to be waited out. It's not gimmick to avoid, and it is not a piece of contraband that can be stopped at the schoolhouse door with policy and Internet filters. Social media is 21st century communications, and school leaders would be guilty of mal-practice not to both learn about its power and place in our modern society. Portfield and Carne's book is an excellent starting point for school leaders to begin the journey or learning about the power of social media. I've read several books on social media written for school leaders this year, and this book is the best by far. It is a no-nonsense, easy-to-read manual on social media. According to Cathy Davidson, we're still getting it wrong. We've got all this technology around us, we are so busy trying to deal with all the distractions, email, Twitter, Facebook, etc. that we honestly are having trouble paying attention. Understand that Davidson's book is not an anti-technology discourse, rather, it is an examination, from the perspective of brain science, how we should be letting the digital transform our lives and work. Instead, in every arena---our personal lives to education to work---we are too busy trying to attend to things the way we always have. Our institutions, instead of capitalizing on the power of the digital to transform what we do, are just trying to preserves themselves. Davidson's book is sure to spark some deep thinking about technology and its ability to transform ourselves and our institutions. I have never been completely happy with the calendar app I have been using on my iPad. 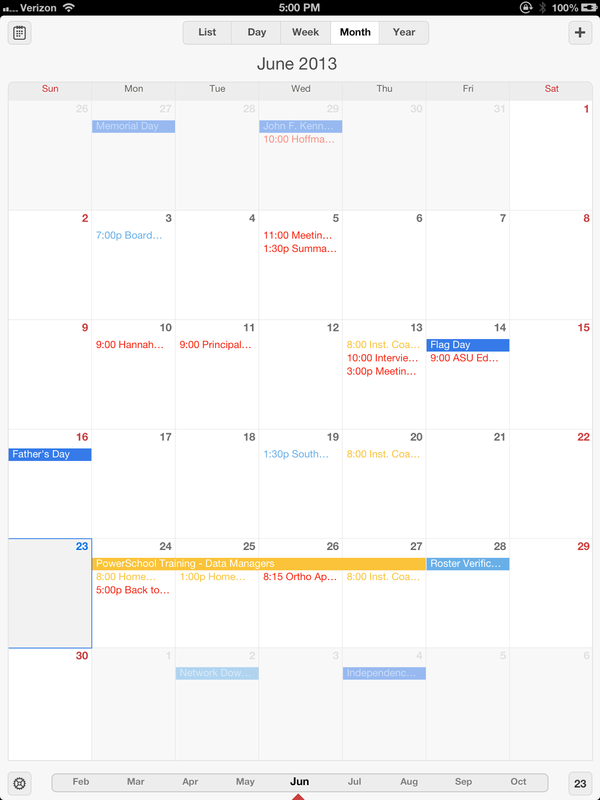 I have been using the Google Search app for both my email and my calendar, and it has worked fine for email, but the calendars feature has a great deal of quirks causes quite a bit of frustration. Since our school district uses Google Apps, being able to sync multiple Google calendars is a must with any calendar app I use on my tablet. With those needs in mind, I think I have found an excellent calendar app that meets all my needs: it is Calendars or Calendars+ by Readdle. Calendars is simply the free version of Calendars+, both by Readdle. While there appears to be a bit of a learning curve with this app, Calendars+ by Readdle has these features that make it a much better way to manage my calendars than Google Search. The Calendars app has a much more pleasing and intuitive interface, which more closely mirrors Google Calendar on the desktop. 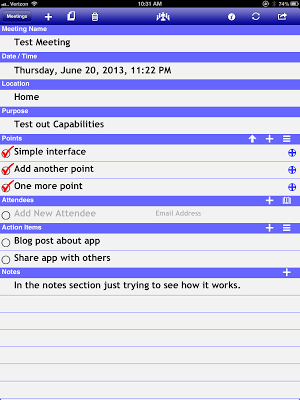 Users can drag and drop events. 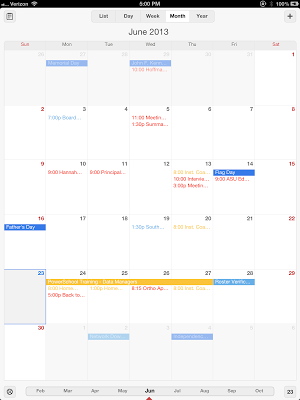 Syncs with all of you Google Calendars so you can access them all on your iPad or iPhone. Manage all your Calendars. This is especially useful for me since I have multiple district calendars to work with. However, according to the web site, this feature is available only with Calendars+, the paid version of the app. Calendars by Readdle (the Free version of the app) and Calendars+ by Readdle are an excellent choice if you are looking for a versatile app that syncs and works with all your Google Calendars. For more information about the free app Calendars check it out here. For Calendars+ (the paid version of this app), check here. When it comes to engaging in innovation with technology, the mindset we take toward technology is extremely important. We can either take a "technology adopter" mindset or we can take a "digital disruptor" mindset. As James McQuivey states in his book, Digital Disruption: Unleashing the Next Wave of Innovation, "Digital disruptors think about opportunity differently." To the technology adopter it's always about the technology. How can I use the technology to help me do the things I currently do better? In contrast, a person with a "digital disruptor" mindset sees the technology as the means to engage in entirely new and different possibilities. Which leads me to ask the question: Which mindset predominately drives technology policy in your school or district? Is it a "technology adopter" mindset or a "Digital Disruptor" mindset? In case you're wondering, here's some characteristics of each. Immediately view a new technological device as a means to do what they have been doing, better. This type of thinking limits the view of technology as only being able to enable teaching and learning as we have been doing it under a 20th century, industrial-age school model. Some examples of this kind of thinking is using e-texts to simply replace physical textbooks. There is no change in pedagogy, just a change in how the information is delivered. Another example of this thinking would be viewing the computer as simply a more efficient means to deliver a multiple-choice test. The power of digital lies in its ability to complete reinvent assessment, not perpetuate the old. See technology’s potential limited by current practice. In other words, technology adopter-educators see only their current teaching practice and are not open to any other. "It's worked for hundreds of years, so why change?" is the attitude. Technology then becomes the means to deli ver what is seen as time-honored traditional forms of teaching and learning, such as lecture or heavy use of textbooks. Technology will never be used innovatively when educators limit it's potential to their current understanding of educational practice. Educators who imagine new ways of doing things. Armed with new technology, they use the capabilities of those technologies to reinvent teaching and learning. These educators have been trying to do that with new online learning environments, new instructional models such as PBL and maker-based classrooms. This mindset views technology as a way to completely reinvent how we teach kids. For example, we don't just purchase e-reader devices and e-books. We ask questions that leading the use of these to transform our instruction and student learning. Educators who see the unlimited potential of technology to disrupt current education practice. Education is a system that is stubborn and resists efforts of transformation. That's why seeing technology's potential as a "disruptive" influence is often times viewed as a negative. Cell phone and social media bans are good examples of that. Yet, if we adopt the view of technology as and opportunity to disrupt, to turn upside-down what we do in schools, we have the potential to transform education into a system that meets the needs of every child. Educators open-minded and willing to let go of the old when it fails. This is a tough one for many in and outside of education. It's as if for every step forward in reforming education, we move three steps backward because of a nostalgic view many hold toward their own schools of the past. They brag about how schools in the 30s and 40s, even 50s did so well, yet forget that dropping out of school was a legitimate career path then, and schools could, and did, discard kids as defective raw materials when they didn't conform. Those schools in the past did do a good job for some, but aren't sufficient in an age where the expectation is that all kids learn. With the digital disruptor mindset, nothing is held sacred when it comes to transforming education. We can choose the mindset with which we approach technology and its potential. The mindset we choose will determine whether we engage in transforming our schools or whether we simply continue to tweak an outdated education system. We can choose the mindset of a technology adopter, which means we continue to look for ways to enhance an obsolete, 20th century model of education, or we can choose the mindset of a digital disruptor. The digital disruptor mindset means we employ the technology to engage new opportunities for reinventing both teaching and learning. You can enter all the logistical information like Name of Meeting, Date/Time, Location, Purpose of Meeting, Main Points of Meeting, Attendees (including their email addresses), List of Action Items, and Notes from the Meeting. You can sync your QuickAgenda notes through your Dropbox account should you have the app on multiple devices. You can share your QuickAgenda notes with others by email by simply entering their email addresses. (The only issues I see with this so far is that apparently you must use the native iPad email app and you do not have access to a contact list.) These two drawbacks aside, it still easily to email your notes. It is currently free in the iTunes store. This app is quite easy to use, even easier that the Journal App that I wrote about earlier in the week here. 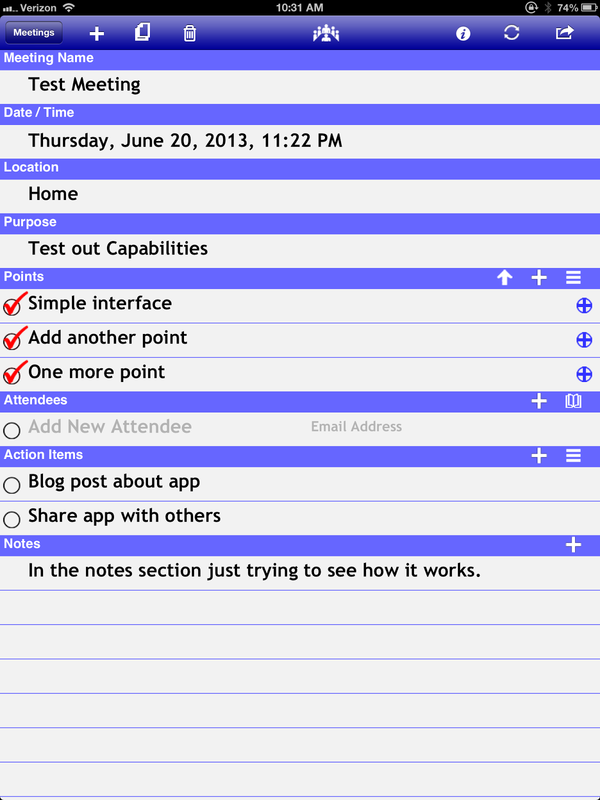 QuickAgenda is an easy-to-use meeting note app that would be quite useful for the school administrator or educator who isn’t looking for a powerful note taking app; just something simple. You can check out QuickAgenda in the iTunes store here. Because of the seriousness of our mission to educate all children, you would think having a “Culture of Ethics and Integrity” would be standard in all education organizations. Educators do a great deal of talking about being role models for kids, but the question I would ask, “Is your school or school district a model "culture of ethics and integrity?” I submit that, not only should we as people be model leaders in the areas of ethics and integrity, our organizations---our schools and our central offices---should be models of these too. In other words, our responsibility as a school leader is to model exactly the kinds of behaviors we want from our students, our staff, and even our parents. We create a "culture of ethics and integrity" when we ourselves are ethical leaders who act with integrity. Cottrell and Harvey provide us with a long “List of Behaviors of Leaders That Actually Discourage Trust, Integrity, and Ethics.” It’s gut check time. See if you have exhibited any of these behaviors or actions lately. Have you promoted someone who was not respected or trusted by other employees? You communicate that respect and trust are not important when you promote those who do not have these traits. Have you professed an ‘Open Door’ policy, but actually discouraged people from using it? If you invite others to speak to you about anything, you need to really demonstrate that you mean it.Telling people your door is always open means exactly that. People can stop by and unload, uninvited. Integrity here is living up to your words. Have you hired employees who do not have what Cottrell and Harvey call ‘Walk-In Ethical Beliefs?” If you want a “Culture of Ethics and Integrity” then you need to hire for it. Bring in people who have a demonstrated history of ethics and integrity. Have you avoided confronting integrity breaches? It takes courage to confront those who have engaged in behaviors that violate ethics and integrity. We like to think adults will be adults, but confronting the unethical is a leadership must. Have you talked about people behind their backs---and/or encouraged others to do the same? This is gossip---plain and simple. It has no place in a “culture of ethics and integrity.” Leaders definitely should never engage in it, and they should let others know such talk is not welcome. Have you withheld information to keep power and control? Schools and school districts, in my experience, are notorious for having fiefdoms and kingdoms where individuals hold on to information just so they have power. There’s no place in a “Culture of Ethics and Integrity” for this behavior. A leader of ethics and who has integrity is not interested in power for power’s sake anyway. Leaders should not behave in this way, and should not tolerate others who do. Have you not considered the organization's shared values when making decisions? If your school or district values ethics and integrity, all decisions are made with this in mind. Leaders always behave with organizational values being front and center. Have you “bad mouthed” the organization and blamed others? School leaders should never confuse honest critique and criticism as “bad mouthing." Bad mouthing is unfair criticism. Honest criticism should be welcomed and embraced. Blaming others is anathema to leadership period and should never be engaged in. Have you failed to preach, teach, and support the organization’s mission, vision, values, and ethical standards? Leadership is about doing all of these. Mission statements posted on walls and value statements that only appear on web sites, but aren't lived by leadership will not make your school or district a culture of ethics and integrity. Have you failed to listen to the ideas and suggestions of others? Worse yet---have you asked for input but ignored the information? Leaders at every level in a school organization need to listen to the suggestions of others. Education organizations are made up of educated people, and to expect those employees to blindly accept and follow is naïve. Educational leaders should expect and welcome the ideas and suggestions of others. And, if you want to destroy ethics and integrity quickly, invite input and then ignore it. Educators immediately get the message---you don’t really care what I think. Have you failed to understand and practice the universal ethical principle---ethics matters in everything you do? There’s no wonder schools and school districts end up in the national news. Most often, this happens because they lose sight of who they are and what really matters. They take shortcuts and avoid doing what is right. Ethics and integrity matter in everything we do. Have you failed to walk the talk? You can’t foster a “Culture of Ethics and Integrity” without living it yourself. Leaders must be ethical---they must act with integrity always. Honestly, with the moral nature of our mission as educational organizations, having a “Culture of Ethics and Integrity” should be standard. It begins when leaders engage in behaviors that foster these values, and avoid behaviors that undermine them. As a 21st century school leader it's up to you to lead the way. What is everyone reading this week? 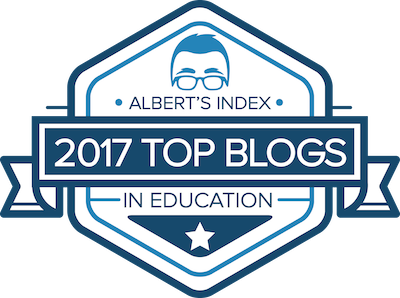 Here’s the most often visited blog posts on the 21st Century Principal this week. 1. “Evernote Journal App for the iPad: Excellent Way to Take Meeting Notes and Keep Logs” Review of a free app for your iPad that allows you to take journal-like notes and sync them to your Evernote account. 2. “Establishing a Culture of Creativity by Paying Attention to Failure” We spend a great of time paying attention to success and winning. Perhaps we need to spend some time in our schools looking at the language we use to talk about failure if we truly want schools with creative cultures. 3. 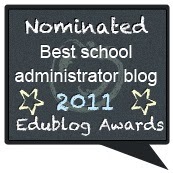 “Why Wouldn’t We Let Students Blog? Reasons to Get Students Blogging” Why would we keep students from blogging? It is the English teacher’s dream. Blogs are the avenue to authentic audiences and authentic writing. 4. “Data-Driven Decision Making Usually Means ‘Test-Score Driven Decision Making” When policymakers use the term “Date-Driven Decision Making,” let’s face it. They mean “Test-Score Driven Decision Making. But if we use just test scores to guide what we do in schools, we ignore much of the most important data. 5. “5 Free Summer Professional Development Resources from ASCD” Complements of ASCD, here’s some great summer professional development resources you can access online. Best of all? They’re free! ASCD is offering what they call “high-impact, in-depth professional development resources” at no cost. Nothing better than Free! These offerings let educators take professional learning into their hands by selecting desired areas for growth and immersing themselves in targeted learning at their own pace. All five are available anytime and anywhere there is an Internet connection. ASCD School Improvement Tool—Designed for use in schools and school systems around the world, this online tool offers educators a comprehensive needs assessment as they prepare for the coming year. The tool launches a 15-minute survey that evaluates a school’s strengths and weaknesses in areas of school climate and culture, family and community engagement, curriculum and instruction, and ability to provide and sustain a whole child approach to education. It also recommends targeted resources that will help educators make the most significant school wide improvements and ensure all learners are healthy, safe, engaged, supported, and challenged. The EduCore™ digital tool—This digital tool is a repository of evidence-based strategies, videos, and supporting documents that help educators transition to the Common Core State Standards. Funded by a grant from the Bill & Melinda Gates Foundation, the tool was developed for U.S. educators implementing the Common Core State Standards in both mathematics and literacy. ASCD’s policy page—This one-stop shop for educators interested in advocacy and education policy offers tips on how to get informed, get involved, and make a difference. Educators can stop by to access ASCD’s legislative agenda (PDF); sign up to receive action alerts; and read ASCD’s policy publications, including the Capitol Connection e-newsletter. Summer Boot Camp Webinar Series­—This five-part summer webinar series just kicked off and will run through August. Attendees will hear tips and strategies from renowned ASCD authors including Harvey Silver, Donald Kachur, Mike Fisher, Janet Hale, Wendy Ostroff, and Judy Willis. Featured topics include teacher-led walk-throughs, curriculum, and motivation and engagement from a developmental science perspective. Sessions will be archived for later viewing. The full ASCD webinar archive dates back to May 2010 and features ASCD’s collection of targeted, expert-led webinars. Book study guides and more—ASCD publishes more than 40 education books a year, often offering free study guides and author interviews that enable educators to read between the lines of their favorite professional development publications. ASCD has also released the ASCD for iPad app, which allows for easy reading of ASCD e-books and lets users explore free electronic versions of member benefits like Educational Leadership,Education Update, and Policy Priorities. For more information about ASCD or ASCD membership, please visit www.ascd.org. To learn more about ASCD's professional development resources and to sign up for free trials of ASCD’s online learning programs, please visit www.ascd.org/pd. NOTE: ASCD's resources for educators are always tops. I love their books, as you can tell through many of my past reviews. But really, do college English instructors still make students engage in kinds of writing that they never do again once they leave English 101 or 102? Sure, the “literary essay” serves some purpose. It's purpose is limited, however, and it is important to remember that it is hardly a truly authentic piece of writing, except maybe for literary scholars. Yes, it can force students to think critically about a literary work, but is it the best way to get students to engage that work critically? There are probably more engaging ways to get students to do that kind of thinking. That’s perhaps where blogging is different and could help. It has the potential to allow students to engage in authentic writing for authentic audiences. Blogging is an authentic publishing platform. As a former classroom teacher, it was a struggle to find places where my students could authentically publish their work. I tried copying and sharing, posting on bulletin boards and in the hallways, but while that was publishing, it was still not authentic. Students knew it and so did I. It was too superficial. Besides, that kind of publishing usually severely limited students to verbal media, which brings me to my second reason to get students blogging. Blogging allows for publishing in multiple forms of media. In old days, my students mostly just communicated their ideas through words, sentences, and paragraphs. Now, with blogs, students can use video, photos, graphics, to communicate their ideas too. Blogging allows students to engage audiences using most of the media tools available, which also allows them to struggle with the authentic question: "Which media best communicates the idea or message I am trying to send?" You just can't get much more authentic than that. Blogging gives students the potential to engage authentic audiences. To me this is blogging’s greatest strength. You post your ideas for the world to see, and if your ideas win the contest for attention, people read and respond. That’s gratifying feedback. Students struggling to be heard on the web is about as authentic as a writing and communication experience can get. Blogging is easy. Chances are, your students are already doing it. If they aren't, the blogging platforms available are easier to operate than word processing software. The more difficult part of blogging is trying to write engaging content that attracts readers. Also sufficiently promoting the material written is important too. Once again, these are two authentic things writers do. Perhaps one of the best reasons for getting students to engage in blogging is best illustrated by one of my own recent, personal blogging experiences. In my post on “Data-Driven Decision Making Usually Means Test-Score Driven Decision Making” I made a serious error, that I am a bit reluctant to admit. But, I see it as one of the most powerful lessons blogging can teach. In that post, I used the word “quantitative” instead of “qualitative." What made the error even more serious, was that the use of the correct word between these two choices was essential to my entire argument. I messed up and then some! What happened that demonstrates the power of blogging occurred when a reader emailed me and politely asked about my error. It was then I went back to my post, and sure enough, I used the wrong word. I quickly changed the error, and emailed a big thanks to that reader. My point about this blogging experience is simple: I made a crucial error in my writing that affected my entire argument. Never mind the embarrassment and never mind the fact that I probably destroyed my entire argument by choosing the wrong word. The real power of learning through blogging lies in the fact that these kinds of authentic experiences have the power to teach students real writing and communication. What better way to learn about the importance of choosing the right word or words as well as proofreading and revising carefully? I should have known better obviously. I have been blogging for some time. I have written more academic papers than I can remember. Still, I failed to edit and revise thoroughly enough, even though I always review, edit and revise a post multiple times before clicking the publish button. This is authentic writing experience, and our students need it too. I am a heavy Chrome browser user. It's not usual for me to operate with multiple tabs open throughout the day. I might have one open to my Blog, another in Facebook, another in my Gmail, and so on. When the version of TweetDeck you're using is the Chrome Browser App, it also normally operates within a Chrome tab. You have to click on a TweetDeck Chrome tab to view the program. It is possible though, to change how the Chrome TweetDeck app behaves so that it functions more like a separate Windows application. Of course you could install the Desktop version of TweetDeck and solve this problem. But I have noticed lately, that Twitter seems to update the Web or Chrome version first when there are new features. This means some of TweetDeck's newest features are available in the Chrome App way before the Desktop app. For example, right now, in the Chrome Browser app, the TweetDeck columns have handles and you can simply click on and drag your those columns into any order you wish. I'm sure this will be available at some point in the desktop version, but for now, it is only available in the Chrome app version. If you would like to have your Chrome TweetDeck app behave more like a separate Windows application, here's how you do that, and you can create a shortcut to your desktop, start menu, or taskbar in the process. 1. Open your TweetDeck App in your Chrome browser and it will appear as a tab below like the illustration below. This is how TweetDeck in Chrome normally operates, as a tab all to its own. 2. After TweetDeck Chrome loads, go to your Chrome Settings button in the top right-hand corner. When you click on the settings button, your drop-down menu appears like below. 3. Select "Tools" from the Menu. Then, select “Create Application Shortcuts.” A dialogue box will appear like the one below. You can choose to pin the Application Shortcut to your Desktop, Start Menu, or Taskbar. Once you select the way you want he shortcut to appear, simply click the "Create" button. Your icon will appear as you have selected, and TweetDeck will open in its own window instead of a tab. 4. Your Chrome TweetDeck app now operates from a separate window, just like the desktop app. Just click on the icon you created to access your Chrome TweetDeck app from now on. This Chrome trick makes your TweetDeck Chrome App operate as its own application. Data-Driven Decision Making Usually Means “Test-Score Driven Decision-Making"
I received another one of those “Data-Driven Decision-Making Workshop” email advertisements the other day. I usually receive several of those during the course of a week. It’s as if someone out there has drawn the conclusion that I do not make decisions based on data, so I am in need of more training in this area. So what is it that most of these workshops offer? They should be entitled, “Test-Score Driven Decision-Making” because that’s what most of them are really about. They are about using test scores to drive all school improvement activities. They're most often about not moving a muscle until you've consulted the numbers. Those who push making decisions based on test scores alone, elevate them to "sacred" status because it is somehow seen as "objective" and above reproach. Their true "objectivity" is certainly always debatable, but test scores are clearly not all the data we have at our disposal as school leaders. I really can’t help but resent the fact that these individuals actually think the decisions I make as an administrator aren't data-driven. I submit that every decision I make as principal is data-driven, otherwise I would be leading a school by the old proverbial “seat of my pants.” But perhaps the data I use isn't "sacred" enough to be considered data by the data-purists. So what do I mean when I say my decision-making is always data-driven? It means that every single time I make a decision, I use data. When I am staring at each and every decision-point, I always begin the process by gathering data. For example, if I notice a student is failing multiple subjects, I have used data (grades) to determine that a student is in trouble. I might then call that student in my office and ask questions to gather additional data. "Why are you struggling in Algebra I?" I might ask. Or, "Is there something that’s keeping you from being successful in biology?" The answers to these questions are data. I would add that this kind of data allows me to make much better inferences regarding a student’s classroom learning and what to do about it than the test scores alone would do. They have had bad teachers in former years. The school they attend is more or less a war zone rather than a school. They didn't have breakfast. In fact, perhaps they are homeless. They didn't get any sleep the night before the test. They hate the subject being tested. Any number of inferences based on those scores may be valid, but I can't immediately jump to the conclusion that his score or the class's test scores are poor because the teacher is a bad teacher. It’s only when I investigate further that I can make any of these inferences valid. When we check with the parents and teachers, we might discover that the real problem is that the child can’t see, and is in need of glasses. Making decisions entirely based on test scores alone is educational malpractice; there's simply no other way to state it. Data-Driven decision making can consider test scores, but it should also include that qualitative stuff that drives data purists nuts. But then, those people don't live in a real world anyway. The point of today’s post isn't to create excuses for bad test scores. The point is to make clear that “data-driven decision-making” should never, ever be just about test scores. Those pushing “promotion-based-on-test-score” schemes for students” and “teacher-evaluations-based-on-test score” schemes would do well to remember that our best decisions about the welfare of the kids, and teachers, in our schools are not based on the latest end of grade tests or latest SAT scores. The best decisions we make might glance at these scores, but are based on data that is much closer to what the student needs are. Our best decisions are made when we take considerable time to investigate and gather much more than numbers on a spreadsheet. So, in order to keep from having to read any more these "data-driven workshop emails, I have set up a Gmail filter to dump them into my trash folder immediately. The whole idea that any one in education could make decisions without data is just plain ludicrous. There are quite a few Evernote apps that extend the note taking program’s functionality, and I have used quite a few of them. Recently, I found Evernote's Journal iPad app. 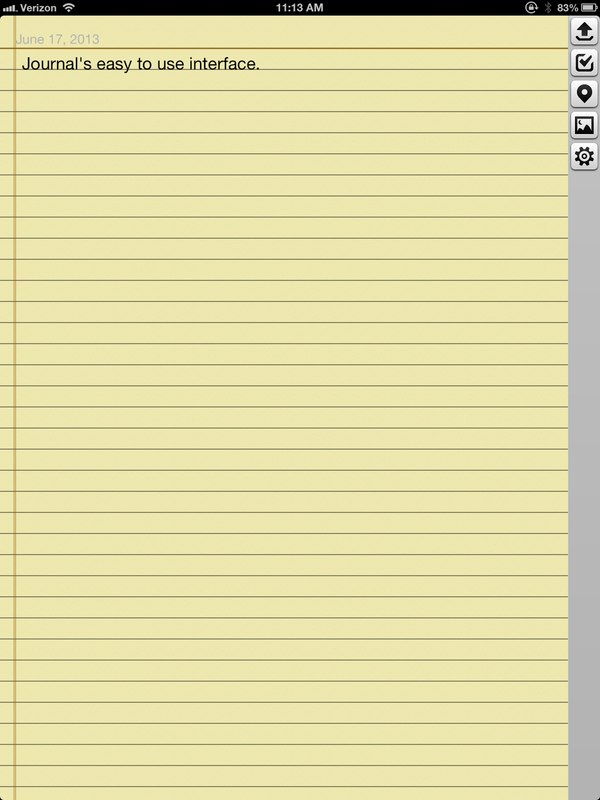 This app makes it possible to keep a journal right in my Evernote application. Being able to do this makes keeping a log or meeting notes even simpler because this app allows you to create those notes with automatic dates right within an Evernote note. Creates a stack in your Evernote account called “My Journal” and stores your notes by date within yearly notebooks. Notes can be saved and uploaded automatically. Date and time is automatically added to the top of your note. Each entry in the Journal app is recorded as a separate note. 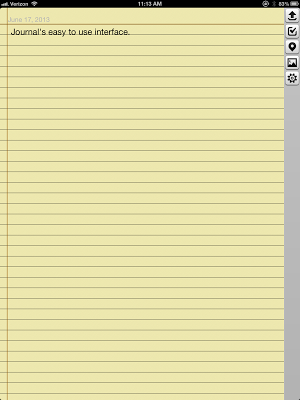 Easy to use interface makes entering notes quite simple. Evernote users looking for a simple way to take meeting notes or keep logs may want to add Journal for Evernote to their iOS device immediately. “We need to be careful that the tests we use in a properly designed teacher-appraisal system do, in fact, contribute to a valid (that is accurate) inference about a teacher’s quality.” W. James Popham, Evaluating America’s Teachers: Mission Possible? North Carolina took the plunge this year and started using test scores as part of teacher and principal evaluations. The state has even invented a "new" kind of test, called a "Measure of Student Learning" in order to make sure there is plenty of test data to go around. What is particularly telling is how "carefully" the state crafted the term "Measures of Student Learning." It's as if somehow, not calling it a test, makes it not a test. State level educational logic never ceases to amaze me. Of course, the state then started calling these "Measures of Student Learning" something else. They started calling them "Common Exams." Notice again, the careful use of the word "exam" rather than "test." It's almost as if you don't call it a test, it isn't a test, but apparently state level policymakers haven't heard the old saw about a rose still being a rose even if it has another name. Besides North Carolina's struggle with what to call their newly implemented tests, there's still the question of what the unintended consequences of having thousands of teachers "teaching to the test" is going to do for students in our state. Ultimately, being able brag that your students "Have the best scores in the world" is most likely what politicians and state level education officials are after. That's why they see salvation through test scores as the means to the "Educational Promised Land." Ultimately, there's a flawed logic driving this whole accountability and testing movement: it's the whole idea that learning can be entirely reduced to bubble sheet answer sheets and taken in a single sitting. And, that teachers can't be trusted to tell when a student has demonstrated that they have learned or not. In my years as an educator, I have been amazed how trusting and accepting educators in North Carolina are when it comes to the latest policy flowing down from on high. It's as if they accept that those at the state level know more than they do, or somehow have access to magical information they do not have. So, when they implement something like the use of test scores in evaluations, many educators accept that the powers that be at the state level know what they are doing, so they trust them. Given the history of reform ideas and educational policy that travels down from on high, this "trust" is highly misplaced. I like to think that state level education officials mean well, but what often has happened during my career, these ideas when implemented locally have sometimes been a disaster and have been sometimes downright bad for kids. Instead of being so trusting, I submit that all educators in the schools and districts need to become skeptics and ask tough questions of our state-level, and federal level policymakers. We should never accept the "trust me, this will work" answer. It is in this spirit of skepticism, I turn to Popham's book, Evaluating America's Teachers: Mission Possible? and our state's venture into making high stakes testing even more high stakes. In spite of what our state-level policymakers say, I am not fully satisfied that North Carolina's tests are adequate measures of educator effectiveness, and a healthy skepticism is still in order. This whole push to add test scores to teacher and principal evaluations has been a rush from the start. Depending on when you asked questions, how the tests were to be implemented has changed multiple times throughout the last two years. Never mind the fact that not a single teacher in North Carolina even saw the test before they were implemented. In their rush to have "test data" it's as if our state level policymakers think "any old data will do." They have failed to take the time to establish whether any of these tests really tell us anything about teaching quality. In light of our state's push into "higher stakes testing", I think Popham reminds us of some important key issues and ideas about tests and teacher evaluations that state politicians and policymakers seem to forget. “Tests are not valid or invalid. Instead, it is a test-based inference whose validity is at issue.” In other words, it isn't the test that’s valid or invalid, it is the inferences drawn from those tests that have these qualities. It boils down to whether you can actually make an inference based on the test or not. The question is whether North Carolina's tests, which have been implemented haphazardly and a thrown-together-manner, actually tell us anything at all about the quality of teaching in our classrooms. Can I honestly say Teacher A is a good teacher because she added "this much" value to her students' Measures of Student Learning? Seems to me that it puts a great deal of faith in a single test. “Tests allow us to make inferences about a test taker. This inference, depending on the appropriateness of the test as a support for the inference being made, may be valid or invalid.” As Popham points out, the inference we make about the learner may be valid or invalid depending on the “appropriateness of the test” in its role to support the inference being made. As we know, the word validity is the extent to which that inference, or conclusion, is well-founded or corresponds to the real world. This boils down to whether the inference we draw about a student is valid or not. For example, should we infer, based on a student’s test scores that he is not proficient in the subject, we must be satisfied that the test we are using is the “appropriate measure,” and we must also make sure the conclusion we draw considers all real world facts. Ignoring a student’s socio-economic status, or even whether he experienced a death in the family, can make our inference about the student’s proficiency invalid. Then there's the whole issue about making an inference about a teacher or principal's effectiveness using this same test. Has North Carolina sufficiently established the appropriateness of their Measures of Student Learning, End of Grade Tests, End of Course Tests, as instruments that allow for making inferences about teacher and principal quality? I'm not sure they have. Another question, do these Measures of Student learning allow us to make valid inferences about teacher quality? I'm not convinced they do. As North Carolina moves forward with a teacher and principal appraisal instrument that uses test scores to determine effectiveness, all educators need to educate themselves and scrupulously ask questions of policymakers at all levels. As Popham suggests, “If heavy importance is being given to students’ performances on state tests for which there is no evidence supporting such an evaluative usage, then teachers (I would add principals too) might wish to engage in further study of this issue so that, armed with pertinent arguments, they can attempt to persuade educational decision makers that more appropriate evidence should be sought.” In other words, all educators, administrators, and teachers need to study how North Carolina or any state is using test scores to determine educator effectiveness. Administrators owe it to their teachers, and themselves, to understand that some of these tests were never designed to determine educator effectiveness, so that data needs to be viewed with skepticism. And, I would add that the manner in which these Measures of Student Learning were developed and are administered may not allow them to draw valid inferences about teacher quality. Test scores in North Carolina currently are only 1/6th of the teacher evaluation, and effective administrators are going to keep this in mind and not let the allure of numbers numb them to the other 5 standards. We remain ignorant of ourselves as leaders when we do not take time throughout the day to reflect with courage about ourselves. In this self-examination, we demonstrate a much-needed respect for ourselves as leaders. Today, take some time to reflect on yourself, your leadership. 1. Value-Added: This word, obviously commandeered from business and industry, is my personal number one Worst Word in Education for a reason. As it's used in education, it seems to imply that our students, our kids, are things to which we make more valuable in some way by the processes and “education” we subject them to. By its nature, it implies that the object to which the value is being added, has no say or part in creating that value. At the worst, it is demeaning because it reduces the kids in our classrooms to objects or raw materials. This term has no place in education, unless of course, you are educating widgets. 2. Technology Integration: The definition of integrate is “to form, coordinate, or blend into a functioning or unified whole.” Educators have been talking for years about “technology integration” as if that’s somehow going to change things and students will suddenly learn more. The problem is, if we are trying to blend technology into a classroom that is already dysfunctional, or we’re trying to unite technology into an education system that already fails too many students, we get a classroom where students use technology but still don't learn. We also get an education system that uses technology to perhaps simply streamline the process of failing too many students. The word “integration” when used with technology, implies that we can successfully blend all these wonderful devices into the classrooms we have and "Presto," we have successful teaching and learning. This naive view of technology and education has outlived its usefulness. This term should no longer have a place in our discussions about technology's role in education. 3. Technology Infusion: I’m not sure this word is any better than the word "integration." Infuse means “to cause to be permeated with something (as a principle of quality) that alters usually for the better.” Some in education have talked about “infusing technology in the classroom” but the problem with this word, like “integration” is that it is simply taking what exists and adding technology to it. What if the existing pedagogy or educational practice is bad? Will giving it an “infusion” of technology somehow make it better? Perhaps, but only if that “tech infusion” addresses the underlying problems to begin with. 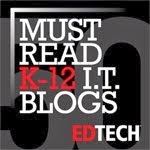 Tech infusion and tech integration are words that educators need to jettison. Both impart “salvation” abilities to technology that it simply doesn't have by itself. 4. Achievement: No, I do not advocate doing away with student achievement, after all, we're in the student achievement business. What I do advocate is that we drop the use of the word “achievement” when everybody knows what we’re talking about are test scores. Why not just say “test scores?" We know that that’s what is meant when policymakers and politicians start talking about achievement. Let’s keep in mind though, achievement and test scores are not entirely interchangeable terms, because whether or a single test score represents what a student has achieved is open for discussion and debate. 5. School Executive: What's wrong with "principal" or "administrator?" Does calling oneself an "executive" fundamentally change what we do and who we are? This trend to start calling school administrators an "executive" betrays thinking that executives somehow have more power or prestige. The truth is, you can change the name all you want, but unless some changes about the role or job, it is still what it's always been. There's a great lesson in the current verbiage used in education. If you really want to assess the current feeling of educational reform and policymaking, pay attention to the language. It always betrays what the people who are making the rules are really thinking and what their real agendas are.